wow! Look at the meat! Certainly a very professional butcher. NPR had a great story the other morning about hunting and the importance some see as being stewards of the environment---of course some didn't see i that way and the conversation got me thinking from each side. 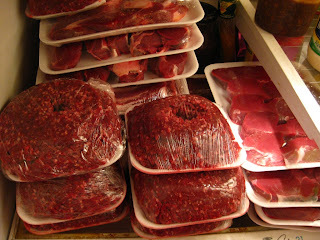 Venison is such good meat for you, and free of preservatives! Venison is delicious. Don't feel bad for liking it either. Here in SC we have the longest deer hunting season in the country because it's the only thing that keeps the population manageable. Did you know that deer kill more Americans per year than any other animal? Now, I will sing "The Circle of Life" in my best Elton John voice. This post should be marked NSFV* lol! I think hunting is much more humane than industrialized meat. Congrats to Scott and his hunting buddy! Wonderful lean meat. Mmmmm venison chili, chimchungas, jerky, sausage...Oh boy! ooh that is a lot of meat!! The chili was awesome! I'm on my 2nd bowl right now. Though in the future, don't listen to Scott, make it hotter! !